Iris gold, twin hole beads pair up with bronze Tila beads in this beauty of a bracelet. The camera can’t capture the glimmering satiny finish of the Tila beads or the unique color variations of the Iris gold beads. Imagine dark pewter, burgundy and gold and you’ll have an idea of the deep shades cascading down the middle of this bracelet, color that will blend with every outfit. But why imagine? Make this project for yourself and enjoy the true colors each time the light plays off of every surface. You’ll fall in love with it all over again each time you wear it. In the following illustrations, the red line represents the thread. The illustrations do not show thread from previous steps, only the thread for the step you’re reading. 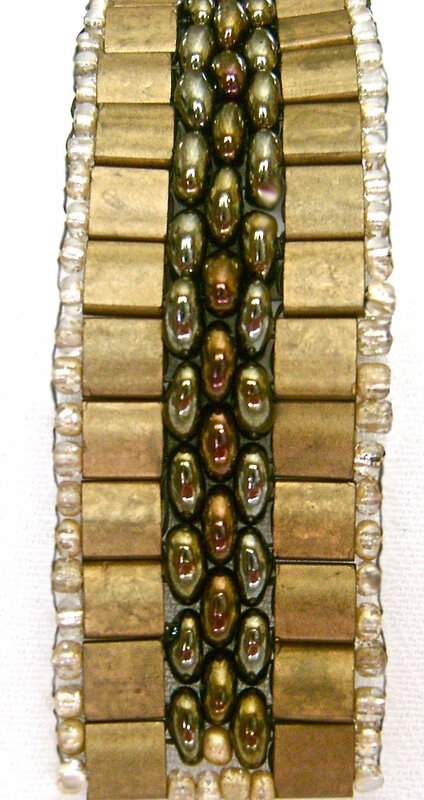 Twin hole beads will be referred to as Twin beads. step 1 - Cut a piece of beading thread to measure two yards, or a length you’re comfortable working with. Attach a stop bead 12 inches from one end. The 12 inches of thread will be used to work in the clasp later. Add a seed bead, Tila bead, a Twin bead, a seed bead, a Twin bead, another Tila bead and seed bead. step 2 - Add a seed bead and move through the bottom holes of the Tila bead, and the first Twin bead. Add a Twin bead and move through the next Twin bead and the Tila bead. Add another seed bead. step 3 - Add a seed bead, and a Tila bead. step 4 - Move up through the bottom holes of the Tila bead in row one and the seed bead. step 5 - Move through the seed bead in row two, and through the top holes of the Tila bead. Add a Twin bead. Go through the bottom hole of the middle Twin bead. Add another Twin bead. step 6 - Add a Tila bead followed by a seed bead. step 7 - Move up to the seed bead and Tila bead in the first row. Go through the bottom holes. step 8 - Move through the top holes of the Tila bead, through the seed bead, add a seed bead then move through the bottom holes of the Tila bead in the second row. step 9 - Move through the first Twin bead, add another Twin bead, then move through the next Twin bead, the Tila bead and add a seed bead. Continue weaving by repeating steps 3 through 9 until you have the length bracelet to fit your wrist. step 10 - End the bracelet by adding one seed bead between the last two Twin beads. When the row is finished add four seed beds between the two Tila beads. step 11 - Thread through the clasp loops then work back and forth through the first three rows with half hitch knots to reinforce the connection and prevent the weight of the clasp from pulling and vertically separating the bead rows. cut off excess thread. Finish the other end of the bracelet in the same way. Four yards of thread were used for my bracelet. See the Beadology for Half Hitch Knot instructions for ending one length of thread and beginning another.